I may not be able to cook, but I certainly can bake. 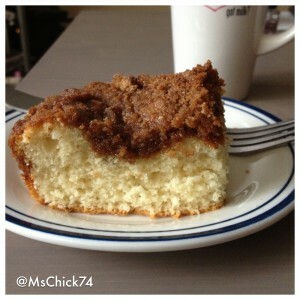 In fact, this coffee cake recipe from Bisquick is one of the first things I learned to bake when I was a little kid. Chocolate chip cookies were the first, but that will be another blog post. In junior high, I took a home ec class. Do they still teach that in public schools? Well, they should, but I digress. This recipe was used to teach us various baking methods. Obviously, I aced that part of the class. The sewing part…not so much. The most difficult thing about this recipe is cutting up the streusel topping. If you’ve never used the two knife method, it might be a little weird. Just keep going, you’ll get all the stuff mixed in together. Also, I sometimes add in different spices. The recipe calls for cinnamon, but I’ll add in nutmeg, cloves, allspice, or cardamom. I’m kidding I almost never use cardamom. Also, I’ve used square pans even though the recipe calls for a round one. I didn’t notice a difference in cooking time or flavor. Heat oven to 375°F. Grease 9-inch round pan. In small bowl, stir streusel ingredients until crumbly; set aside. In medium bowl, mix coffee cake ingredients until blended. Spread in pan. Sprinkle with streusel. Bake 18 to 22 minutes or until golden brown.